Everything changed for Karen Hoskin while she was traveling in India. Not because she fell under the spell of a yogi or went on a month-long pilgrimage to the country’s holy sites. It was a far simpler activity that proved to be just as transcendent. She ordered a glass of Old Monk rum in the beach town of Goa and tasting real rum for the first time. The spirit, a vestige of the country’s British era, has been made in India since 1954, blended and aged for at least eight years to imbue the dark spirit with a complex, deep flavor that was a far cry from the sugary-sweet rums Karen had encountered elsewhere. She could drink it straight—no need for the excess calories and saccharin tastes of a mixer—and the next day she wasn’t the least bit hung over. “I was just the unofficial rum ambassador for years,” she says after that first encounter. But it wasn’t until she went to Guatemala years later that her love of the spirit evolved from adoration to a life-changing love affair. There she visited the home of Ron Zacapa Centenario, one of the Caribbean’s premium rums. Like many other distilleries in the region, they followed the practice of high-elevation rum distilling, storing the barrels at 7,500 feet above sea level on the upper slopes of Guatemala’s volcanic mountains to take advantage of the variable temperature and climate conditions at higher elevations. Another misperception, that rum is an island spirit, was shattered. And Karen, who worked as a graphic designer in Silverton, Colorado, at the time, knew where she could easily access some serious high-alpine terrain. She’d visited Guatemala in the spring of 2008. By November she’d let all her clients go and, with the help of her husband Brice, opened the Montanya Rum Distillery. The timing proved serendipitous. The country was already riding a wave of affection for craft beer, with Colorado leading the pack of informed, inspired consumers interested not only in the taste of something new, but also in the pioneer DIY spirit behind these smaller-scale artisans. Craft spirits naturally got swept up in that groundswell. By August 2011, their operation had outgrown their 800-square-foot facility in Silverton, so they moved deeper into Colorado’s iconic mountains, settling in the snow globe-perfect ski town of Crested Butte. Today their operations stretch across two facilities, covering 5,200 square feet, including the central distillery and tasting room as well as a warehouse that serves ground zero for their distribution operation, which covers 42 states and seven countries. Yet even with this meteoric rise, the central focus on quality remains. “Of the distilleries in the United States, we’re one of the most hand-crafted,” says Karen. Montanya’s rums are distilled in manually-operated alembic copper pot stills from Portugal, which glow a tantalizing bronze color and are shaped like Aladdin’s lamp, topped with a graceful swan neck. They look like something you’d find in the laboratory from Fantasia. What you won’t find are computers or control panels. By overseeing each stage, they can taste, and respond, to the rum as it matures through every stage in the process. They use pure mountain spring water in the distillation process—sourced locally from an aquifer 350 feet below the town. Their rum is aged in American oak barrels from Denver’s Stranahan’s Whiskey, and Karen insists that the fluctuating temperatures that are common at 9,000 feet help imbue the rum with a level of complexity that simply wouldn’t occur at lower elevations. Crested Butte’s elevation also allows for a lower boiling time, further reducing Montanya’s carbon footprint. But it’s more than merely making their Crested Butte facilities environmentally aware. They’re 100% wind-powered, sure. But Karen and her team of 18 employees also focus on all elements of sustainable spirit creation, which is how they ended up sourcing their sugar cane from a family-owned mill located in Louisiana. They had been getting their sugar cane from Hawaii, using a processing facility in California. But news broke that the California operation was supplementing their supply with Mexican sugar cane whenever the Hawaiian supplies diminished. Mexican sugar cane (like other sugar cane farms that fuel the rum industry) didn’t adhere to Montanya’s strict environmental, harvest, and growing practices—nor was it non-GMO or American-grown. Around that time, a couple vacationing in Crested Butte visited the distillery and—as fate would have it—worked in a sugar cane facility in the Pelican State. Montanya started sourcing all their sugar cane exclusively from them in 2012. Such attention to locally sourced materials and socially aware practices don’t come cheap, but it’s worth the price. Besides, in reality “there’s no cheap rum,” Karen says, explaining the hidden costs to bottles of cheap “mega rum,” from low worker wages to land devastation from poor agricultural practices. Aligning themselves with that part of the rum industry would be antithetical to Montanya’s holistic approach toward making some of America’s most thoughtful rum. But none of that would matter if the rum wasn’t top notch. Like the rum Karen first tasted in Goa, Montanya’s rums reject all associations with cloying sweetness. The focus is on complex, deep, revelatory flavors; the kind of spirit that you could sip on its own, or that could stand proudly as the centerpiece of a cocktail. Bartenders are responding to this new wave of high-quality craft rum, building new cocktails and resurrecting old classics that were once lost in the tidal wave of lesser versions of the spirit. Tiki bars are flourishing in San Francisco and New York. And consumers are getting in on the secret as well. Montanya currently makes three rums: The Platino is aged for one year in barrels that housed both Colorado whiskey and Montanya Oro rum, before being run through a coconut husk charcoal filter to remove the color from the barrels. But, unlike lots of other white rums on the market, it retains its flavor, enhanced by a small touch of Colorado Rocky Mountain honey when bottled. It’s won nine gold medals and two best-in-class designations in a variety of spirits competitions. The Oro, meanwhile, is aged for two to five years in whiskey barrels to produce a deeper, full-bodied flavor that brings more of the American white oak to play. And last October, they also unveiled the Montanya Exclusiva, a limited release that ages in whiskey barrels for two years, and then gets another six months in French oak barrels that once housed cab sav and Port from Sutcliffe Vineyards to add a dry, tannic finish atypical to most rums. This last one is, tragically, only available in Montanya’s home state. 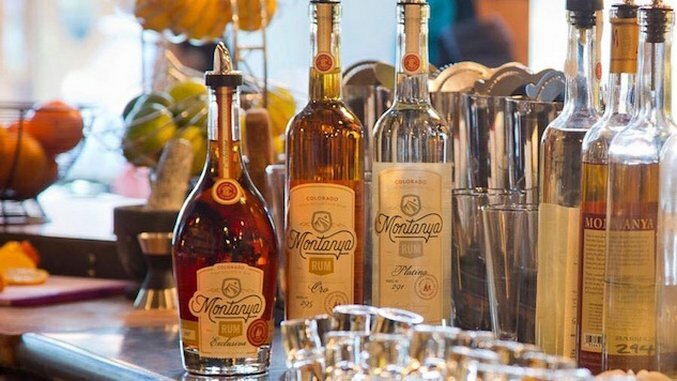 Obviously, the ideal way to experience Montanya’s rum is in their Crested Butte tasting room. The heat produced in the rum-making process creates the perfectly cozy après-ski atmosphere to wander in from the cold and have a sample or a cocktail. If you make it to the distillery, grab a bottle of Exclusiva to take home and try Karen’s favorite cocktail. The Ti’ Punch, which is said to be the world’s original rum punch, pre-dating the daiquiri. Just take some dark rum, like Exclusiva, and mix with lime and a bit of simple syrup. For the rest of us who won’t be in Colorado soon enough to sample the Excluvia, go for a Hemingway Daiquiri, a drink that’s a far cry from the cruise ship nightmare you may envision when you hear its name. Directions: Add all ingredients in a shaker on ice, then strain and garnish with lime wheel and serve in a coupe.